Teky will work with you to design newletters, pamphlets, booklets and other materials for print or for posting to websites. The following are samples of our recent booklets for artist David Goatley and the Cranberry Web newsletter for the Cranberry Marketing Commission. This 46 page soft-cover catalogue of the works included in the Nanaimo Art Gallery's Retrospective Exhibition of a selection of David's British Columbia portraits takes us on a journey from his arrival in Canada in 1990 to 2011. 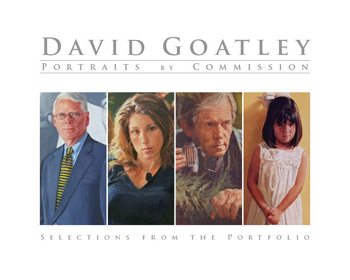 Selection From the Portfolio is a 22 page booklet featuring a small sample of the approximately 300 commissioned portraits David has painted to date. In 2006 Sharon was asked to design a masthead for Cranberry Web and put together (organize, edit, layout, etc.) the first issue from a collection of ideas and articles provided by the client. Here is an image of a recent issue of Cranberry Web. To see the website we've designed for the BC Cranberry Marketing Commission and to read issues of Cranberry Web visit www.bccranberries.com.